The location was in Pentagon City, Virginia. The "Take It!" 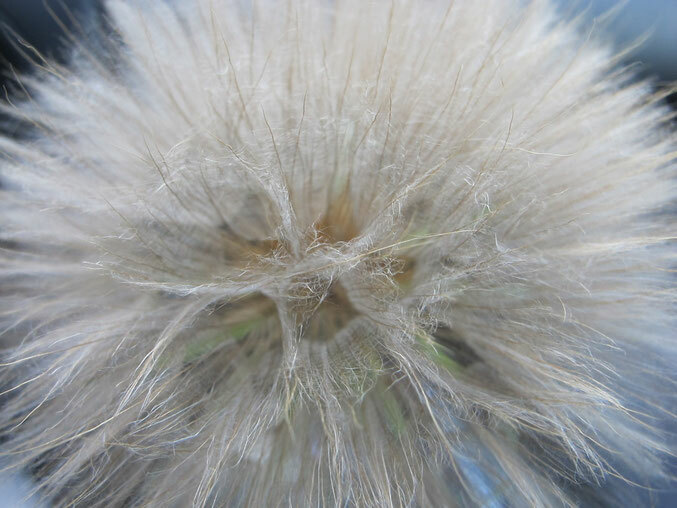 came from one of those moments when I had stopped the car before entering a street and happened to look on the other side of the street and saw in that small section of open land between the curb and the sidewalk what looked to be a giant dandelion. This was not so, but it was so perfect in shape that I brought the car to a full halt and got out and went across the street and picked it just to have a closer look at it as we made our way forward. I decided it was unusual enough to try a close up photo of it and much to my amazement a face like appearance emerged from the segmented center of the bloom. The After Take: This photo got more than a few " WOW ! " reactions. Needless to say it was fun inviting the observers imaginations to see a snow monkey in the center of it. Everyone seemed to see the monkey adding a second tier of delight to the sharing. I had to let everyone know that not to long after picking and bringing the flower into the car - both Taylor ( my driving copilot ) and I started to feel an allergic reaction. I never seem to have this sort of thing - but Taylor gets hit with it frequently. So, not that sneezing is new to me - but doing it as a reaction to a plant certainly was. Lets just say - should this type of flower be seen at roadside in the future it will remain unpicked by your photo taking observer. This looks familiar. When you are out there look for a purple flowered plant that looks like a round bulb. If you see those thats what this is. I forget the name but they are a very common allergen. I too suffer from allergies. They are no fun! Crystal clear image for how close you are getting. What a cool looking plant. It does resemble a dandy.